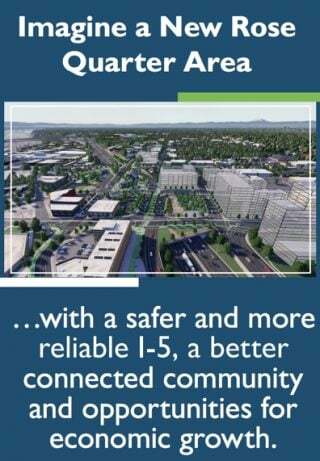 The proposed elements of the I-5 Rose Quarter project. Yellow lines are new freeway lanes. 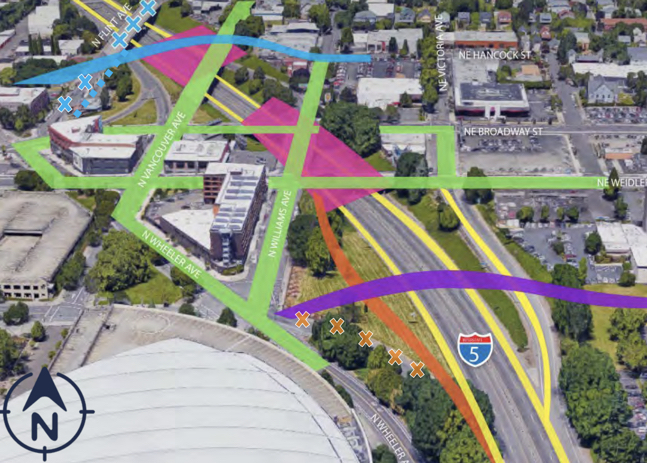 A coalition with concerns over the State of Oregon’s planned $450 million expansion of Interstate 5 through Portland’s Rose Quarter have requested more time to consider the project’s environmental impacts. The Oregon Department of Transportation (ODOT) expects to release the findings of their federally-mandated Environmental Assessment (EA) of the I-5 Rose Quarter project in January. That document typically comes with a 30-day public comment period. The No More Freeways coalition — a grassroots group fighting the project — sent a letter (below) to ODOT this morning requesting an additional 60 days. The letter, signed by 31 representatives from social justice, public health, environmental, and transportation advocacy groups, said 30 days is, “inadequate for us to meaningfully review the disclosed materials, assess the findings about air quality and congestion, and provide thoughtful feedback about this project’s impacts.” The letter also says given that the comment period will likely overlap with two federal holidays, the comment period could end up resulting in as few as 18 business days to provide feedback. This isn’t the first time ODOT has heard concerns about this issue. 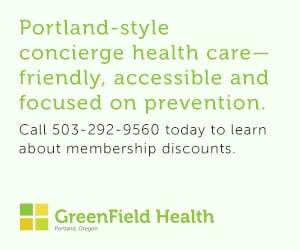 ODOT graphic from project brochure. Then in July, Metro Councilor Bob Stacey put ODOT on notice when he said their approach to the NEPA process wouldn’t adequately vet community concerns around the project. 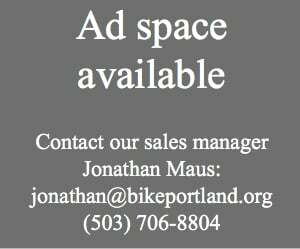 Earlier this month, members of the Portland Bureau of Transportation Bicycle Advisory Committee again questioned an ODOT project manager on this issue. BAC Member Sarah Iannorone asked ODOT’s Megan Channell (on hand to share an update on bicycling and walking plans in the project) if she thought 30 days was long enough. “30 days is the standard for a federal project,” Channell replied. When Iannarone followed-up to say Portland should to exceed federal standards, Channel said ODOT would entertain the idea of a longer comment period if a formal request was made. Air quality around Tubman Middle School, which is just yards away from where one of the new freeway lanes will be added, will be one aspect of the EA that will get a lot of attention. After the comment period on the EA concludes, ODOT plans to begin design of this project in spring 2019. The post No More Freeways coalition requests more time for feedback on environmental impacts of I-5 expansion appeared first on BikePortland.org.